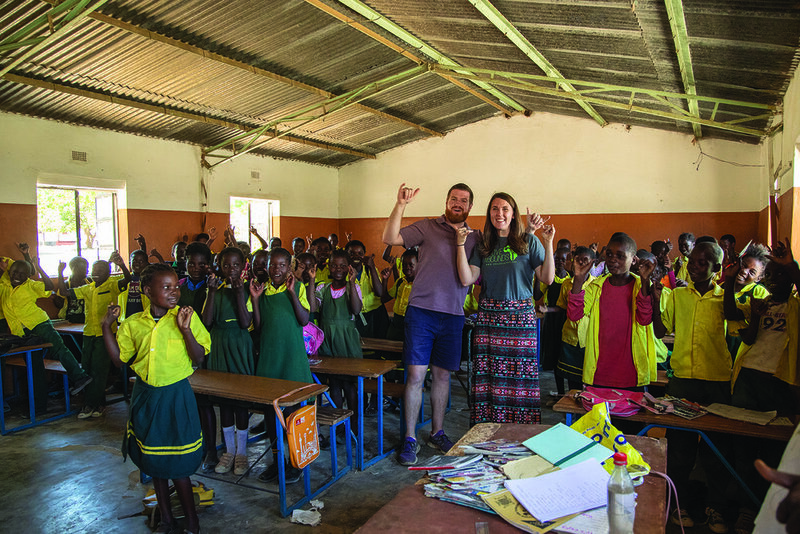 From Fuquay-Varina to Zambia, Love Abounds is changing lives. David and Bethany Morgan believe in the importance of cultivating community. In fact, building strong communities with acts of love is a touchstone of everything they do. Life Okendewa’s private tutor, Ida, teaches the children three afternoons a week. David, an attorney by trade and self-described entrepreneur by heart, is a partner at Morgan & Perry Law in Fuquay-Varina, his hometown. The Morgans are also cofounders and executive directors of Love Abounds, a nonprofit that is working to change lives in Zambia. To hear them tell it, the law practice and nonprofit share the same founding principles and community-based vision. “We want to have a good relationship with the community,” David says. That holds true regardless of whether it’s a community in North Carolina or a remote Zambian village. In late 2013, the newly married couple listened in church as the pastor mentioned a project to build wells and provide clean drinking water in rural Zambia. 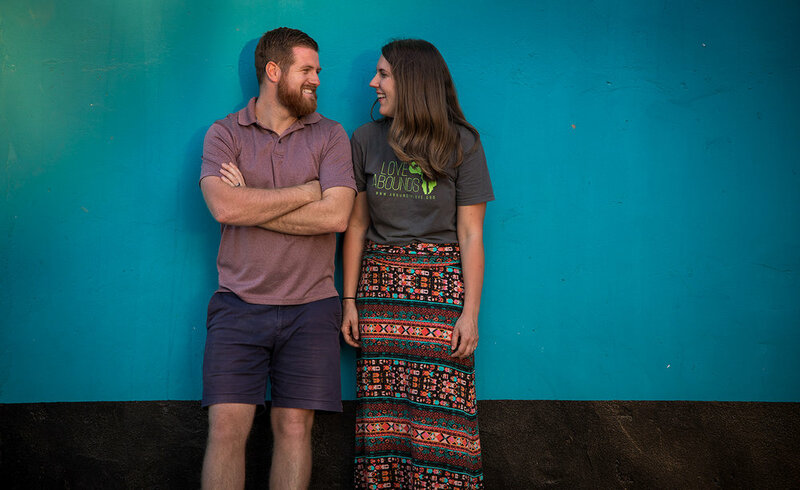 When the pastor asked if anyone was interested the Morgans remember looking at each other and saying, “Let’s go for it!” After successfully raising money for three wells, they traveled to the village of Kunchubwi, eager to see the results. They met the people and saw a crucial need, and they immediately began plans to provide more aid. Bethany holding baby Stephen, grandson of Headman Stephen and Chicks Empowered manager, Jennifer. Today, with help from Tony and Carol Curl, the in-country directors who manage the day-to-day activities in Kunchubwi, Love Abounds is growing. “Love Abounds is the culmination of a desire that we had in our hearts for years,” David says. Not wanting to assume they had the best ideas for a country and culture they had never lived in, the Morgans were sensitive in their approach. They met with the village headman—similar to a mayor—and asked his thoughts on a successful project to help the women become more financially stable. Like many remote villages in Zambia, the men often travel to find work and the women bear the sole responsibility for the upbringing of children. Bethany explains the women are more likely to spend money for the benefit of the children and community. Together, the headman and the Morgans decided that chicken farming would be a profitable enterprise. A program they named Chicks Empowered was launched, which enabled the women to generate income year-round and more than quadrupled their monthly income. David says the ability to provide for their families creates a sense of pride in the women that ripples out to the community. Longtime supporter, Carson Matthews, and Kunchubwi friend, Andrew, get ready for a braai (cookout). The Morgans are also committed to respecting cultural differences in their future endeavor of partnering with Zambian coffee farmers to help them increase their profits. On a recent trip to the village, the Morgans brought a coffee-growing expert with them to meet with farmers and discuss plans for a venture that would enable local farmers to grow a high-yield bean and increase the selling price, essentially creating a more sustainable system and connecting them directly with the Fuquay-Varina community. The plan will unfold in stages, starting with exporting the coffee beans to Fuquay-Varina to be roasted and sold locally. Future plans include opening a coffee shop in Fuquay-Varina, complete with roaster, and serving single-origin Zambian coffee. Love Abounds will be part of that coffee from the time it’s grown in Zambia until it’s poured in a customer’s cup. The profit from coffee sales will provide ongoing revenue to fund more Love Abounds projects. 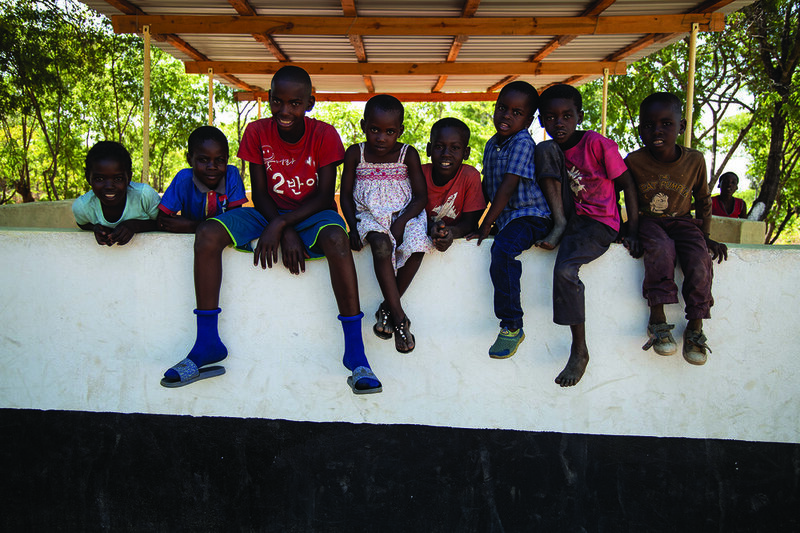 Village children wait for an afterschool program at the Love Abounds community playground and picnic shelter. The coffee project directly connects the two communities that are so close to the Morgans’ hearts, and their vision to serve Kunchubwi villagers comes home to benefit the local community as well: Reciprocity in action. Running a nonprofit in an impoverished Zambian village comes with challenges, especially building trust in relationships and navigating the government red tape that an outsider may not anticipate. For a small organization, Love Abounds has been able to accomplish so much. The majority of funding comes from the Morgans’ church, friends, family, and social media connections. “It’s pretty much all bootstrap financing,” Bethany explains, and they believe their success comes from staying true to their original vision of focusing on one community and changing it from the inside out. Amid the daily hardships in Kunchubwi, love and happiness thrive. Because, more than a charity, Love Abounds is a labor of love. To learn more about Love Abounds and all of its projects, visit AboundInLove.org.